In this worksheet students are presented with some data about food which they interpret in order to answer questions about foods we like. We all like some foods and there are going to be some we don't like at all. For example who likes sweetcorn? See - some say "yummy" and some say "yuck!". 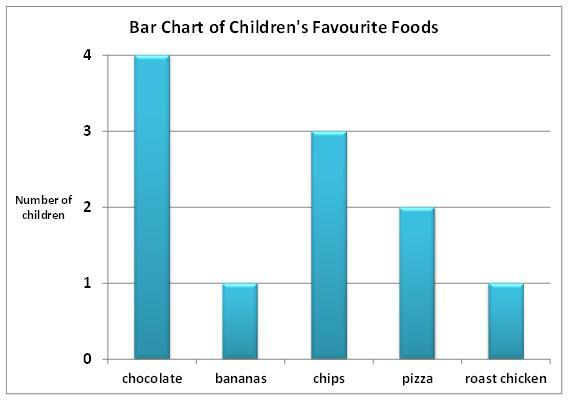 See if you can use the information in the graph to answer questions about the children's favourite foods. What was the most popular food? How many children liked pizza best? How many children liked bananas best? Which TWO of the foods were the least popular for the class? 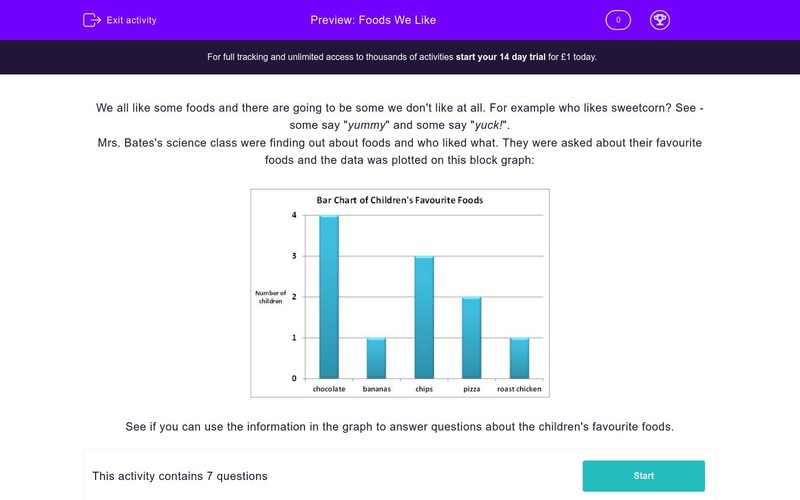 How many children were asked about their favourite foods? If we want to stay healthy how often can we eat food that is not very good for us? Which of these statements do you agree with most? Statement A: "It is best to eat as much as possible." Statement B: "It is best to eat lots of different types of foods." Statement C: "It is best to eat whatever we fancy." If you look at the block graph you can see that 4 children liked chocolate best, 3 liked chips and 2 liked pizza (see which number the top of the blue bar lines up with), so more children liked chocolate as their favourite food than any other. If you look at the block graph you can see that the blue bar for pizza lines up with the number 2 on the left, on the upright line (vertical axis), meaning that pizza was two children's favourite food. If you look at the block graph you can see that the blue bar for bananas lines up with the number 1 on the left, on the upright line (vertical axis), meaning that bananas were the favourite food of just one person in the class. If you look at the block graph you can see that there are two foods that only one of the children liked best - bananas and roast chicken. Oo, tricky one!! If you can see that 4 children liked chocolate best, you add up how many children liked each food and you can see that there are 11 children. Chocolate = 4, bananas = 1, chips = 3, pizza = 2, roast chicken = 1. Add those up and what have you got? Take chocolate - it's full of sugar and fat (which we don't want too much of) but it's yummy! If we had chocolate every day, that really would not be good for us, but if we never had it at all we'd be missing out on something delicious. So, every now and then is fine. It is good for our bodies to eat a variety of foods as that will give us the energy and nutrients that we need. It would be bad to eat as much as possible as we'd get awfully fat and if we only ate what we fancied we'd probably not have a balanced diet so we'd miss out on important vitamins and minerals. Is It Alive Or Not Alive?